The portable Massage Therapy System is a medically approved device, which uses a combination of cycloidal oscillation and infrared heat to alleviate the secondary symptoms of many health conditions. The Cyclo-ssage Massage Therapy System contains nine massage units, which each produce a three-dimensional massage action known as Cycloidal Oscillation. Non-percussive and multi directional this soothing action penetrates deep into the muscle tissue with no adverse side effects. Producing increased muscle activity and dramatically improved localised blood circulation; Cycloidal massage will alleviate the secondary symptoms of many medical conditions and will assist the body to generally work more efficiently. Cycloidal massage therapy is often the preferred choice of medical practitioners and professionals rather than a percussive type of massage due to its non-aggressive action but also because of its effectiveness in providing on going pain relief medication free. The Massage Therapy System has two separate infrared heat Zones that contain a total of six infrared heat lenses. Each infrared zone can be simply controlled to target the correct level of infrared heat to relieve the secondary symptoms of your condition in a particular area. Far infrared is a safe and soothing heat source, which penetrates deep into the soft tissue, dilating blood vessels, relaxing tired and aching muscles. The bodies’ natural healing process is accelerated and the immune system is also encouraged to work more efficiently resulting in improved health and well-being. Accelerating oxygenated blood to the cells and the removal of waste products dramatically increases blood circulation. Muscles are relaxed and muscle spasm eased by activating the muscle tissue. Joint pain and stiffness are also greatly reduced. Improved Lymphatic drainage will reduce swelling and fluid retention; encourage healing assisting the immune system to work more efficiently. Due to the localized increase in circulation, muscle flexion and joint mobility are improved helping to reduce ache and pain in problem areas. Pain and ache relief can be achieved in many cases without the on going need for painkillers and medication avoiding common side effects. The deep soothing full body massage therapy will reduce stress and anxiety improving relaxation and irregular sleep patterns. A simple to operate hand held digital timed control allows you to choose the type and intensity of massage and infrared heat, which is most beneficial for your particular condition. 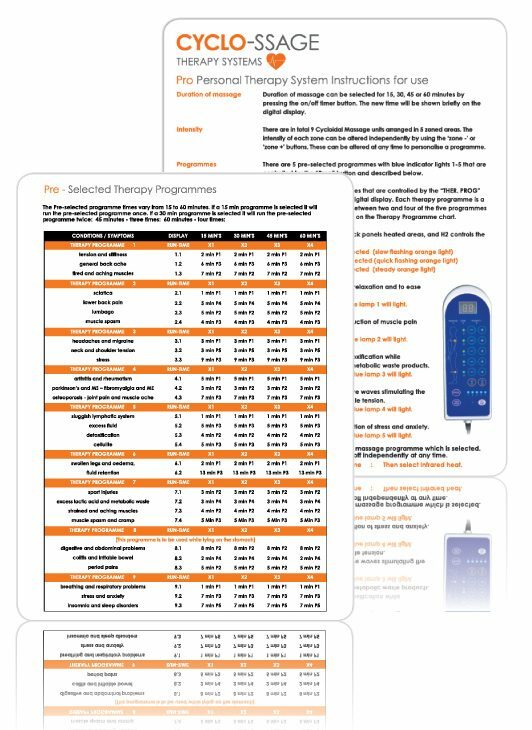 You can have total control of your own treatment by independently selecting two different heat zones and five different massage zones. Alternatively you can simply choose one of the five basic programmes or one of nine pre-selected medical programmes, which have been designed for your specific condition. Just choose a time and a therapy programme. There are choices of three basic positions that can be adopted when using the Therapy System. The Full Body Therapy Position is achieved by lying on the back, and using the massage zones and infra red heat to target key areas such as the shoulders, back, lumbar, legs and calves. The support cushions can be used to design the correct posture for your own particular needs ensuring that you receive maximum benefit from the treatment. The Foot Therapy Position requires the user to lie on the back while bending the knees, allowing the feet to be placed directly onto the infrared foot lenses. This will enable the massage and the infrared heat to stimulate the muscles and the nerve endings found in the feet and the reflexology zones This often produces many beneficial results and pain relief from conditions such as Plantar Fasciitis. The Prone Therapy Position is typically used for individuals who suffer with conditions that affect the stomach area, such as cramps and irritable bowel syndrome. This position is achieved by removing the upper and lower cushions allowing the user to lie flat on their front. The massage and infrared heat therapy can then be used to target any problem areas while lying comfortably in the prone position. The Cyclo-ssage Therapy System can be used to stimulate the reflexology zones in the feet by lying in the “Foot Therapy position” and selecting the infrared heat and the Cycloidal massage in the foot zone area. 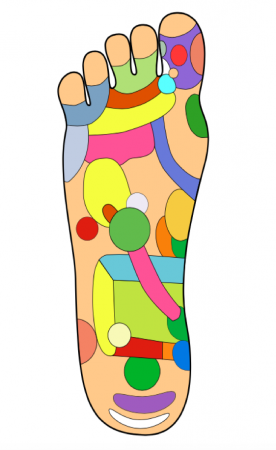 Various areas of the feet correspond to organs and systems of the body. By stimulating these areas and the many nerves found in the feet it can result in the alleviation of problems found in the corresponding area of the body. Increased relaxation, improved circulation, pain relief, and the overall improvement of wellbeing is often experienced after just a 15 minute treatment using the Therapy System.